What kind of life do you want to have if you are 80 years old now? Mr. Torii talks expressively about an idea of the way of life after retirement with vitality not looking like 80 years old person. Please enjoy also the demonstration by the portable earthquake experience device, “Konamazu” which he invented 2 years ago. Since child time, his interest for woodwork or metalwork processing was not simple. He was a child who went alone to factory to stare carpenter or smith work. In junior high school time, he was charmed by the fact how “iron sharpens iron” with the turning lathe machine, and dreaming to be a lathe machine operator in future. Just after graduated, he joined Makita Electric Tool Co., and acquired study as a lathe machine operator. He experienced pleasure and strictness about manufacturing for 45 years. After retired, he successively held a public hall director, a chairperson in the town block, a representative of local disaster prevention activity group. 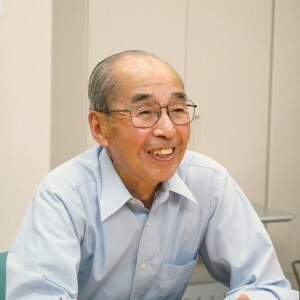 Through those social activities, he realized the importance of the earthquake experience, and invented the portable earthquake experience device “Konamazu”(little catfish in Japanese). We regret to inform you that Mr. Torii passed away on March 25, 2016. He was eighty years old. It is so sad for us that we can’t see his bright smile anymore. We never forget it. We extend our sincere condolences to his family.